The first tubes from series production start to come in. I expect shipments of just a few pairs each week during the next month. 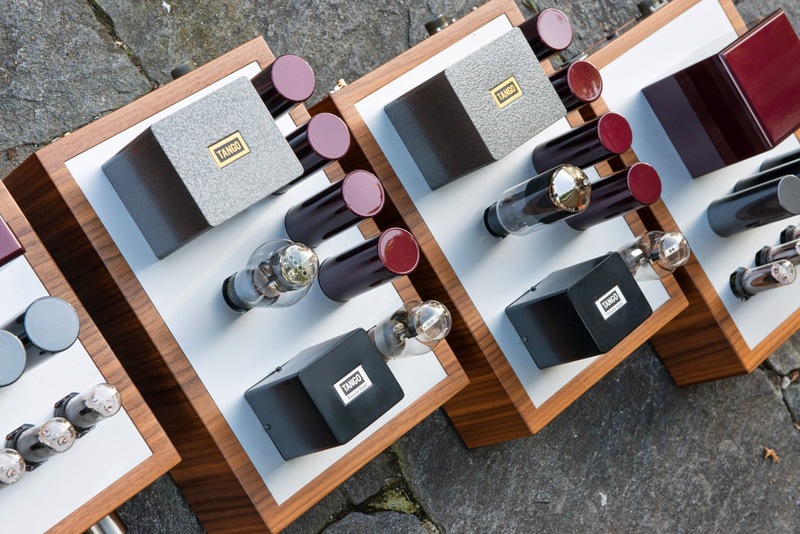 Since there is already a considerable queue of pre orders, I am not taking any more orders until most of the already pre ordered tubes are delivered. Further impressions of the tubes will be published soon when I also get some feedback from other listeners. Stay tuned. Most of you probably expected the 300B to be this months tube. But after all the attention it got on my blog recently, I decided to set a counterpoint by selecting a totally different tube for October. 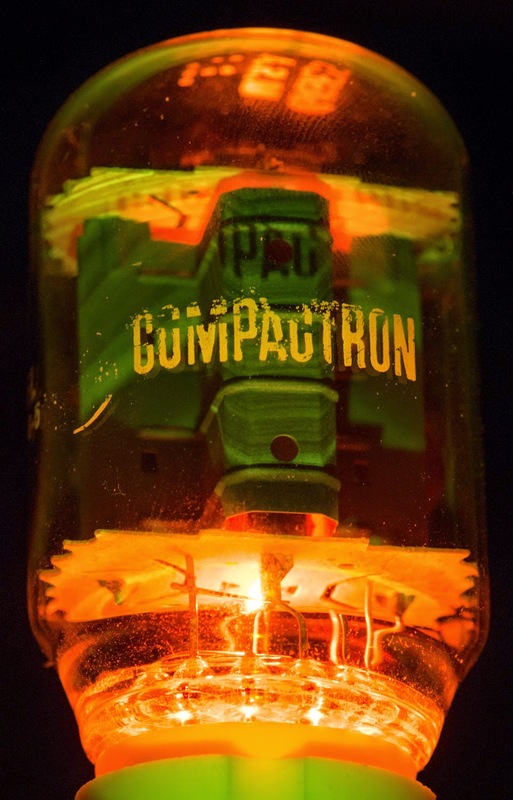 A Compactron Beam Power Pentode, the 6GE5. As fond as I am of directly heated triodes, I also like to work with 'sleepers'. 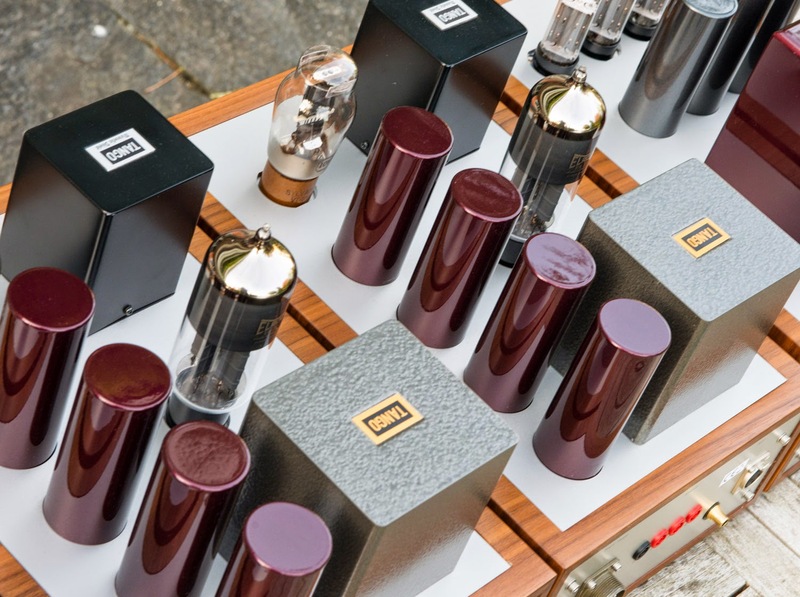 These are tubes which are largely ignored by tube amplifier builders but which are very usable in audio applications. One of them is the 6CB5A, also a beam power pentode. 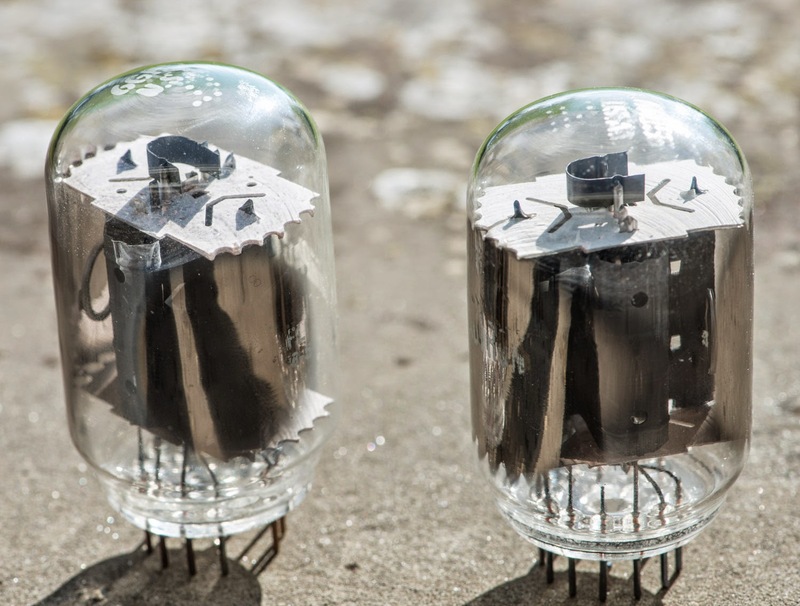 Many years ago I proposed the use of triode strapped 6CB5As as low cost 300B alternative. 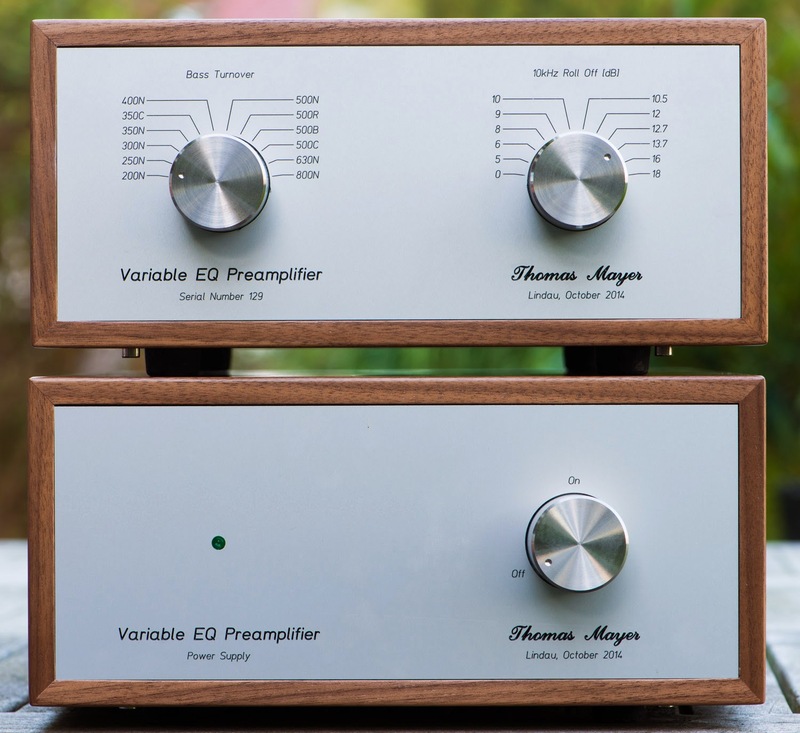 Quite a few 6CB5A amps have been built around the globe since then. 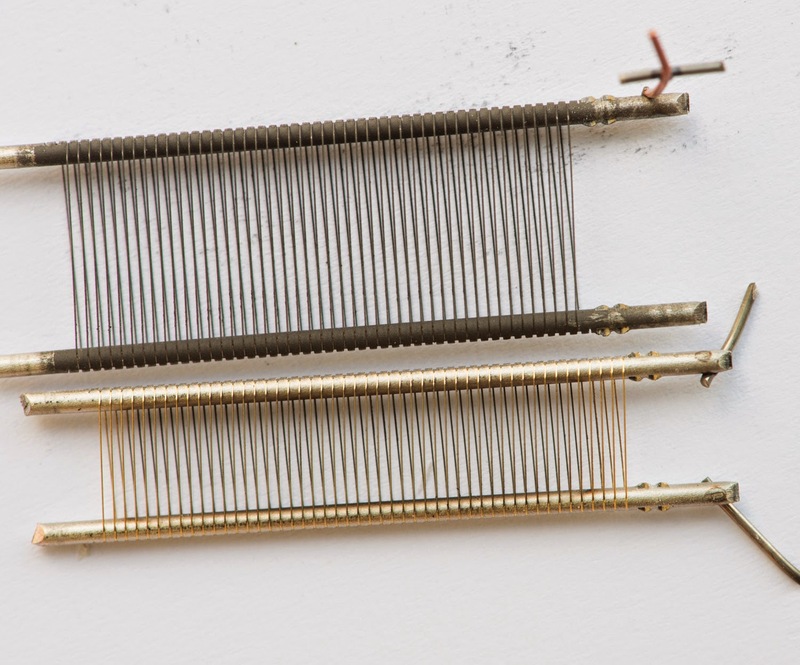 In the 1960ies General Electric introduced the compactron tubes with 12 pin bases. 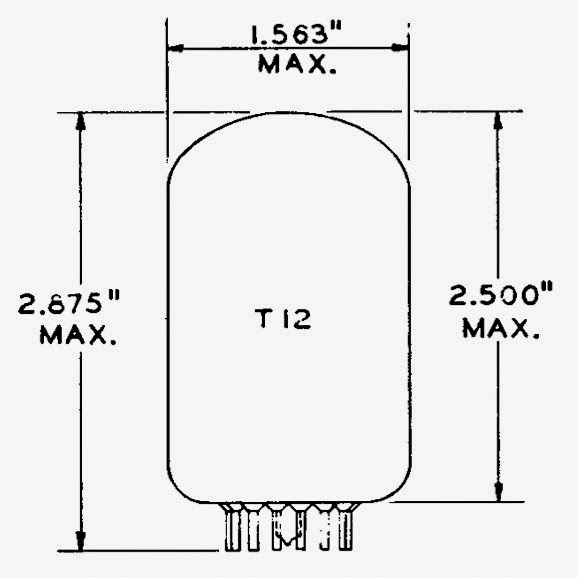 This class of tubes was intended to rival the transistor which started to replace vacuum tubes. 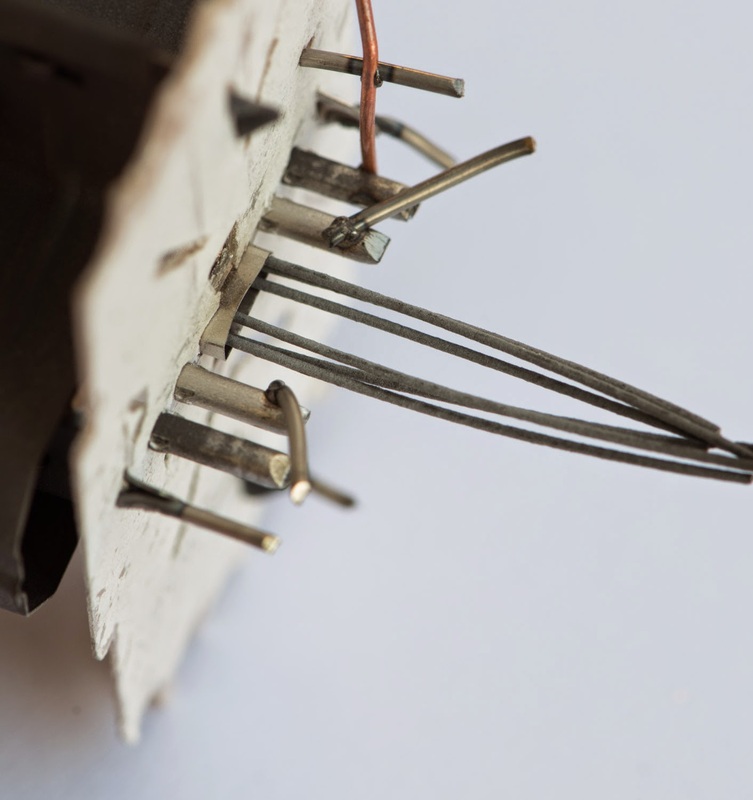 With the 12 pins more systems could be integrated into a single bulb. There have been triple triodes, quad diodes, twin pentodes and many combinations. 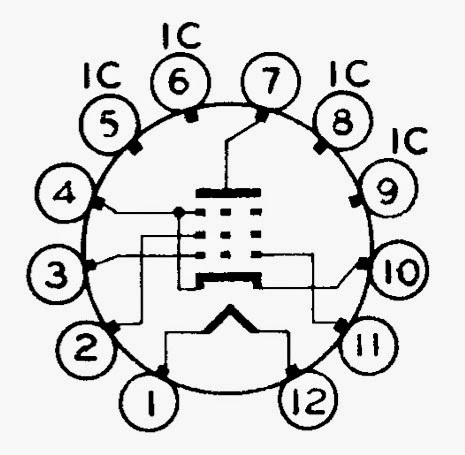 The 6GE5 is a single beam power pentode, thus it does not need all the 12 pins. 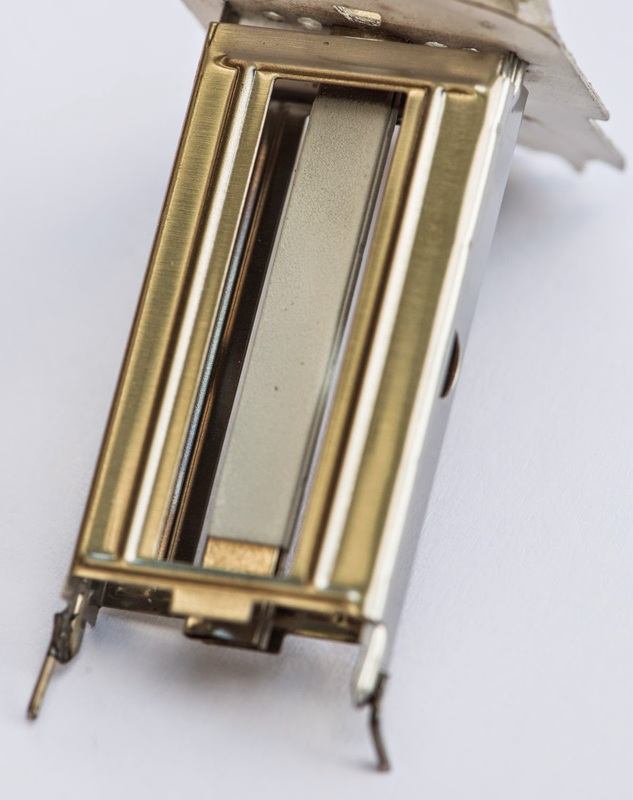 Yet many such types with single systems have also been put on 12 pin compactron bases to enable TV sets which only need a single type of socket. 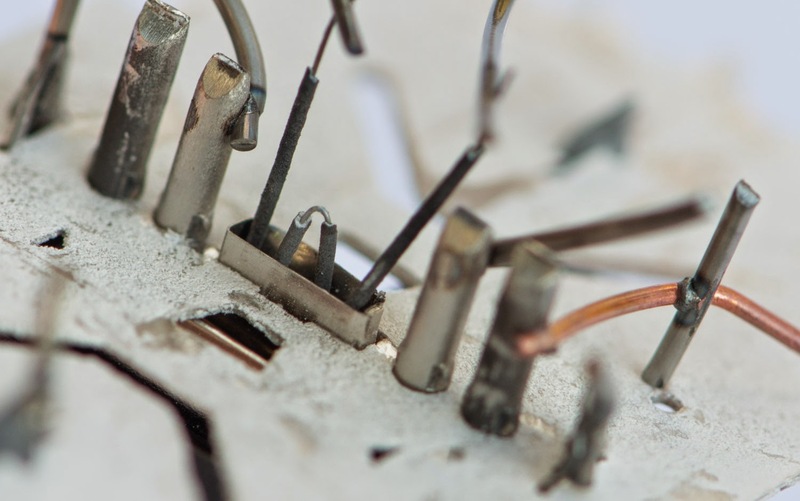 I already covered some 12 pin compactron types, the 6U10, 6HS5, 6HV5A and 6CG3. There are many more hidden gems in this series of tubes and I intend to present some of them during the next year. 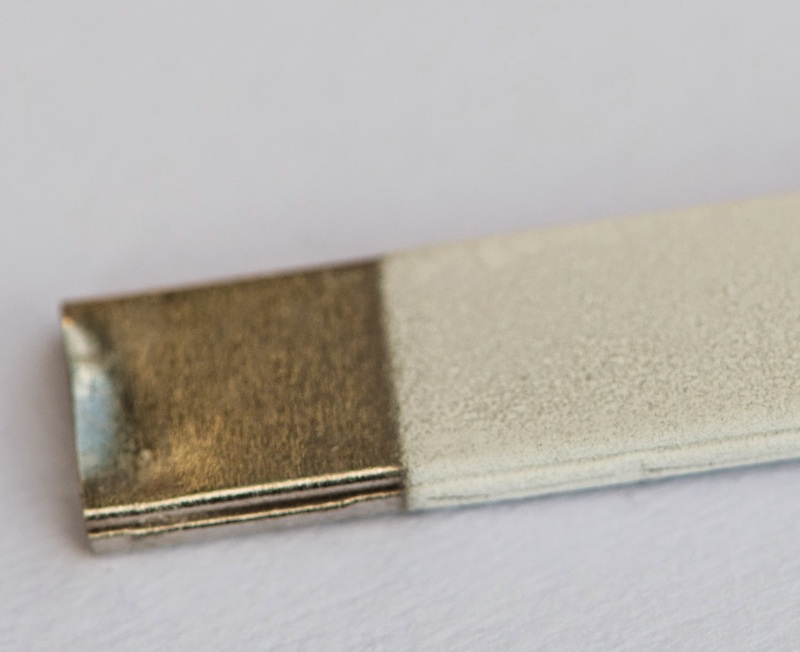 This is about as good as you can expect from an indirectly heated tube. Quite good linearity in the mid range with the spacings of the pate curves getting a bit larger between the 0V and 10V grid step. How about the transconductance? This can be derived from the plate curves, but I took the easy way and just measured it on the tube tester. With 300V on the plate and 55mA current I got 5300 micromohs (5.3mS) almost identical to the 2A3s 5250. The plate resistance is easily calculated as amplification factor divided by transconductance which gives 830 Ohms. Again close to the 2A3s 800. The 6GE5 has a nice shape with it's rather short but and bottle. Operation into a 5kOhm load is represented by the blue line. I would pick 300V on the plate and 55mA as operating point. 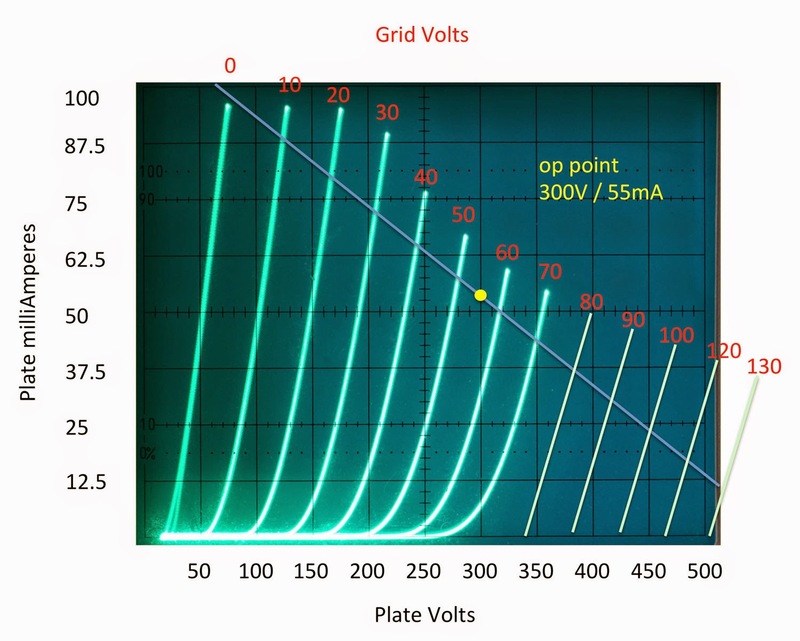 The bias voltage on the grid is -55V which is convenient since it can be obtained with a 1kOhm cathode resistor. The B+ voltage would then have to be set to about 350V. It would be 355V to be exact but no need to be picky. A solid 4W should be obtainable like this. Expect more about this tube on my blog soon. 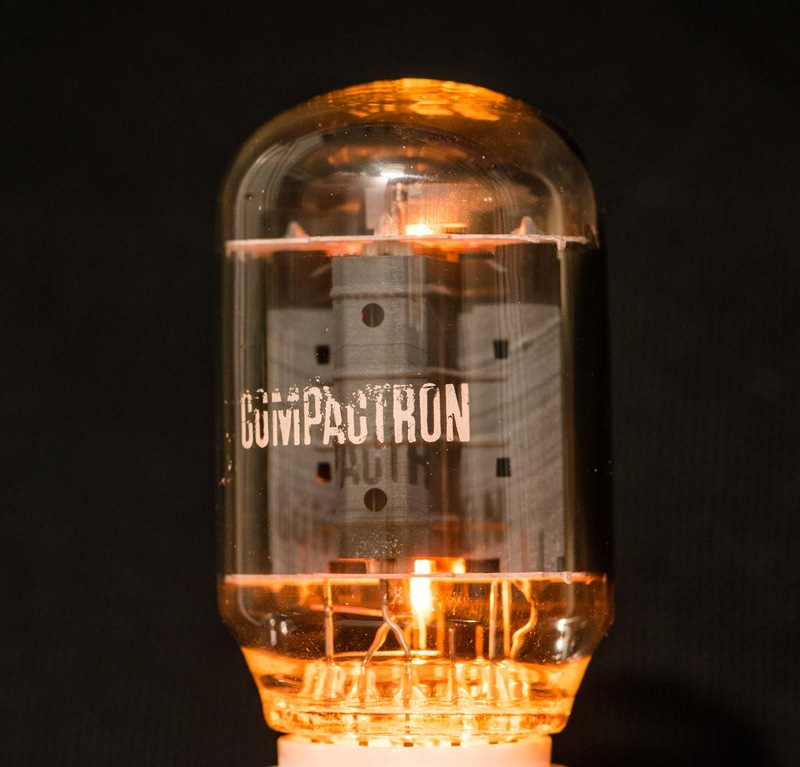 After selection of a suitable driver tube from the 12-pin compactron series, I will build a prototype amp. Stay tuned! This years ETF is coming up. As last year I will post reports and keep you updated about the highlights of the event. I will also show some stuff myself,a new version of the ShellacSavor preamp with variable EQ settings for 78rpm records. This preamp will be part of a joint set up with my friend Frank, who introduced me to 78rpm records after last years ETF. Frank prepared a presentation and will talk about the history of Shellac records and we will demo with a broad selection of Jazz music. 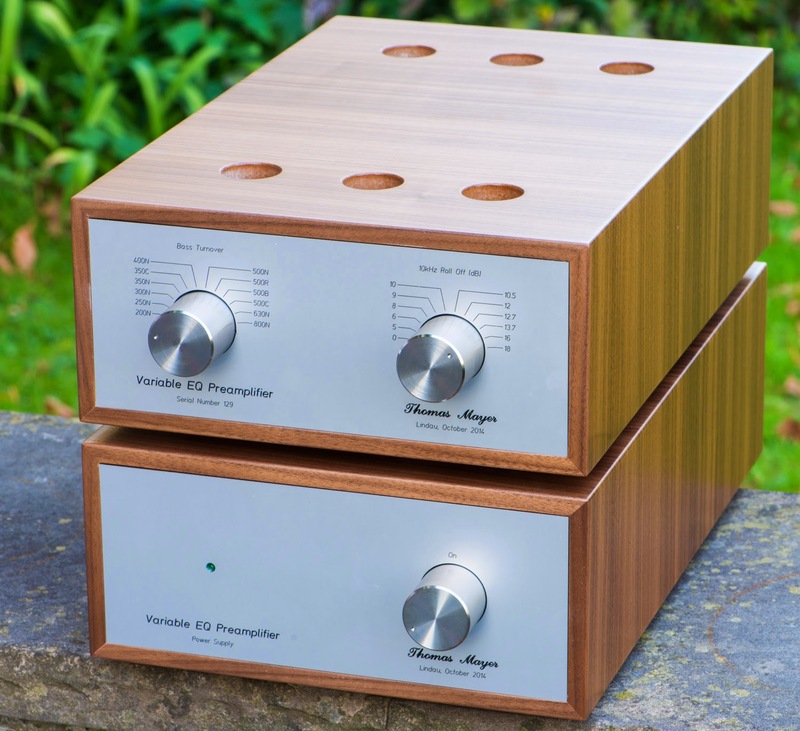 Different to the first implementation, the new preamp comes with a separate power supply to minimise PSU interference. Besides this I will also bring a D3a LCR phono stage, the 'phase 1' cost down version. 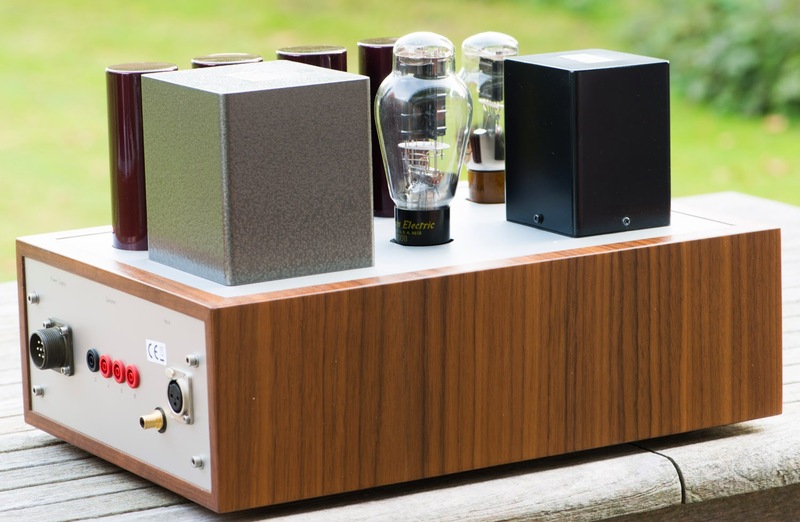 It will be combined with a matching line stage, the 6AH4 preamplifier. These units will be part of the system of the Munich gang. Tune in November 20th through 23rd for 'almost live' updates from the ETF! After having the tubes for about a week now and after various listening sessions and measurements, I am ready to share my first impressions. As was expected, Elrog would not just merely try to copy the Western Electric 300B. There are already various 300Bs on the market trying to achieve that. Some of them actually not bad at all. So the intention was to create something which has the potential to be better and yet compatible with existing 300B amplifiers. 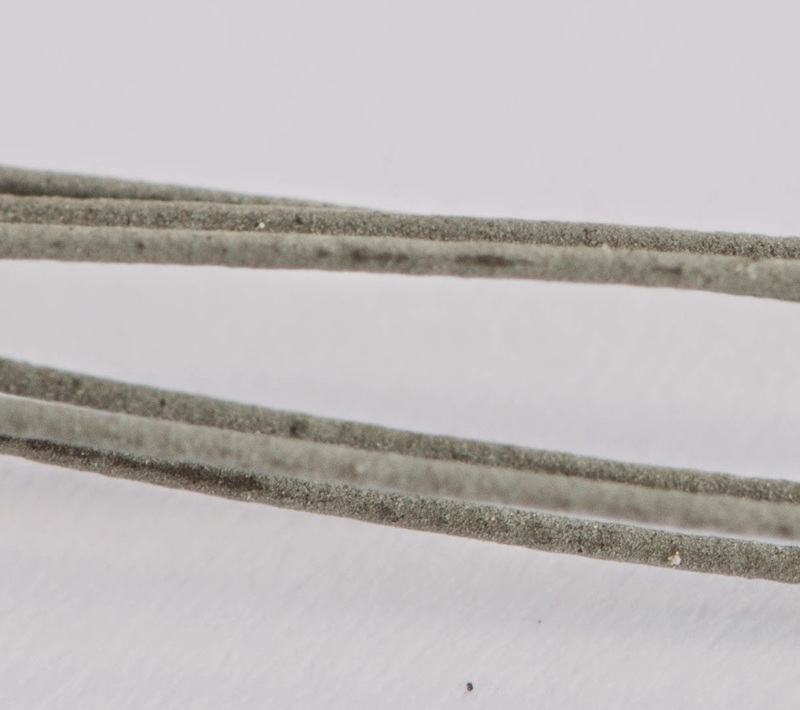 When I had my initial discussion about a 300B with Dr. Schaffernicht during my visit in 2013, I mentioned that a 300B with thoriated tungsten filaments would be something really new and cool. People who follow my blog probably noticed my preference for these bright filament tubes. Dr. Schaffernicht liked this idea a lot, since he already has plenty experience with thoriated tungsten filaments from the 211 and 845s. Initially it seemed impossible to do that and keep the spec for filament voltage and current. So first experiments were started using oxide coated filaments which I helped to get from one of the large tube manufacturers. 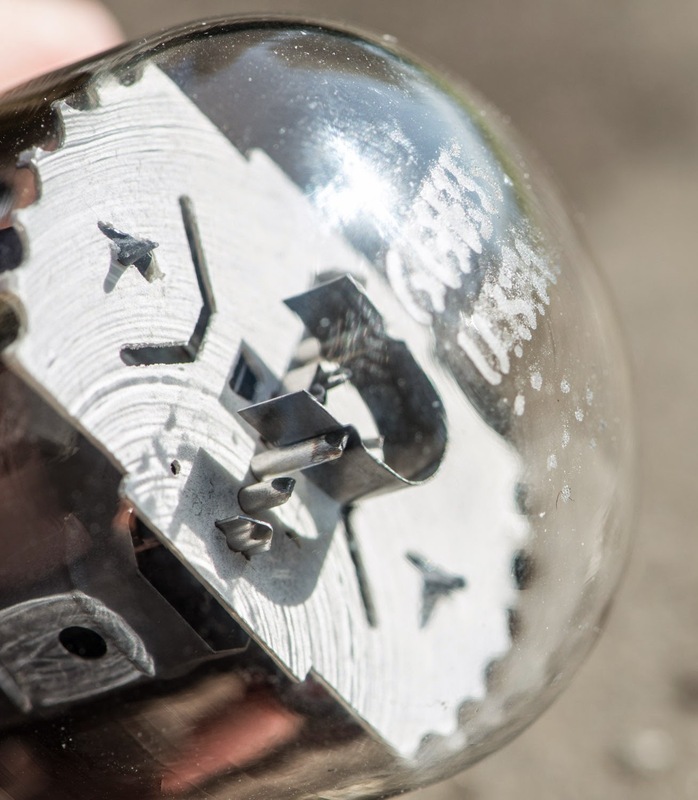 But Dr. Schaffernicht wouldn't let go of the initial idea to use thoriated tungsten. He finally came up with a design which enables the use of the bright filaments as can be seen on the photo above. Filament voltage and current are exactly to spec. 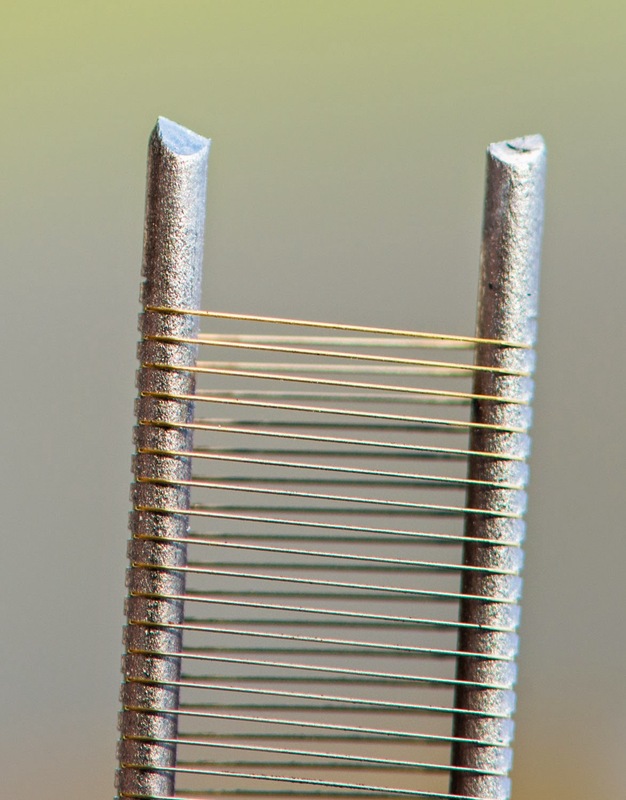 The filaments draw 1.2A at 5V which is the same as the Western Electric 300B consumes. So how does it sound? The famous question every audiophile wants to get answered. This puts me in a conundrum for several reasons. First I am distributing the Elrog tubes. So I have a commercial interest involved. Please take this into account when reading my findings. Second I never was a big promoter of the 300B. Always seeking different tubes which are less hyped by the mainstream. Like 45 or 801A. 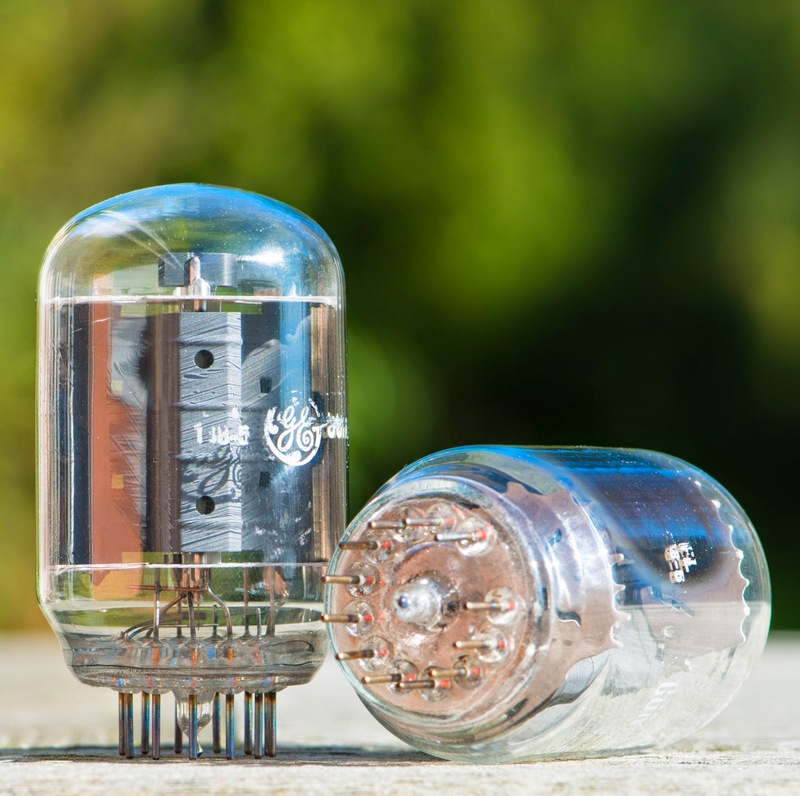 Instead of the 300B I often suggested a triode connected 6CB5A as cheap and good sounding alternative. See also my post about that here. The Elrog ER-300B changes the picture for me. 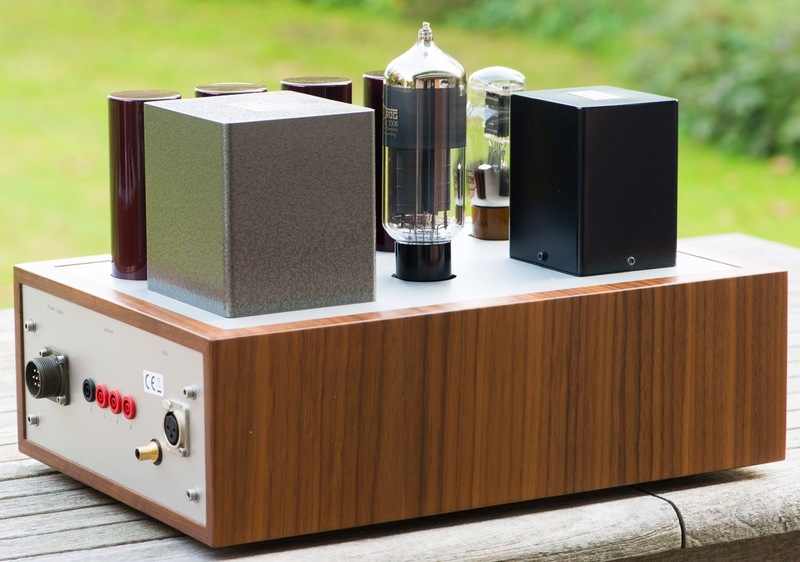 This is the best sounding output tube I ever listened too! Many might think now of course he is saying that, he wants to sell the tubes. That's why I am very open about this and ask you to take it with a grain of salt. Especially since I have a preference for thoriated tungsten. Also the findings so far have only been done in a single amp. The one I showed in the previous post. 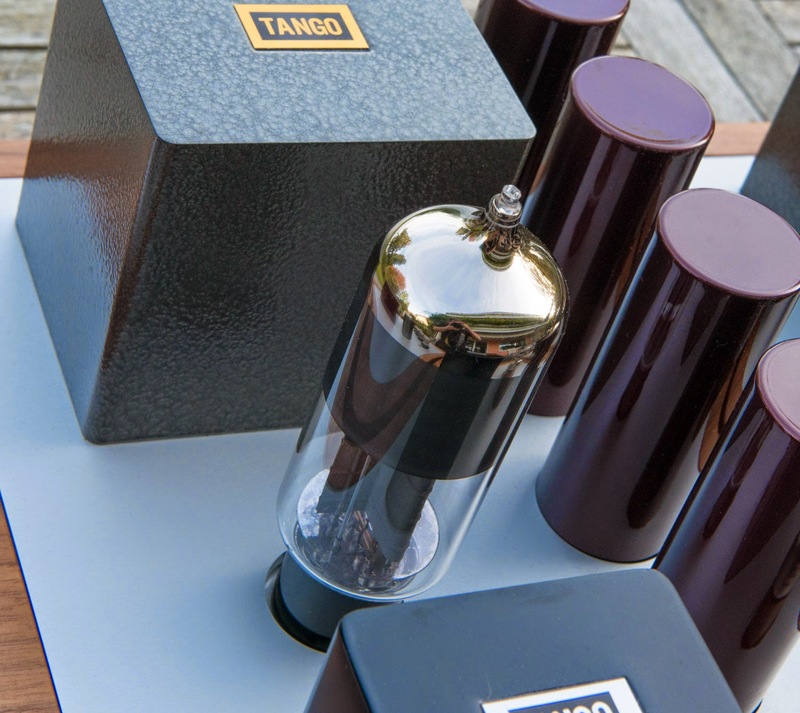 What does 'the best tube I ever heard' mean? After I plugged the tubes in, I was confronted with an almost shocking realism. Gone was the slight softness in the bass which I heard with other 300Bs. The resolution is increased considerably. The beauty of the voices and tone colours of the WE 300B are fully retained. Since one can easily get carried away in the first moments of enthusiasm, I waited with positing my findings and see if the impression stays after listening for some days. And it did! One could argue, that it is not really a 300B anymore and I agree. You could call it a transmitting style 300B. 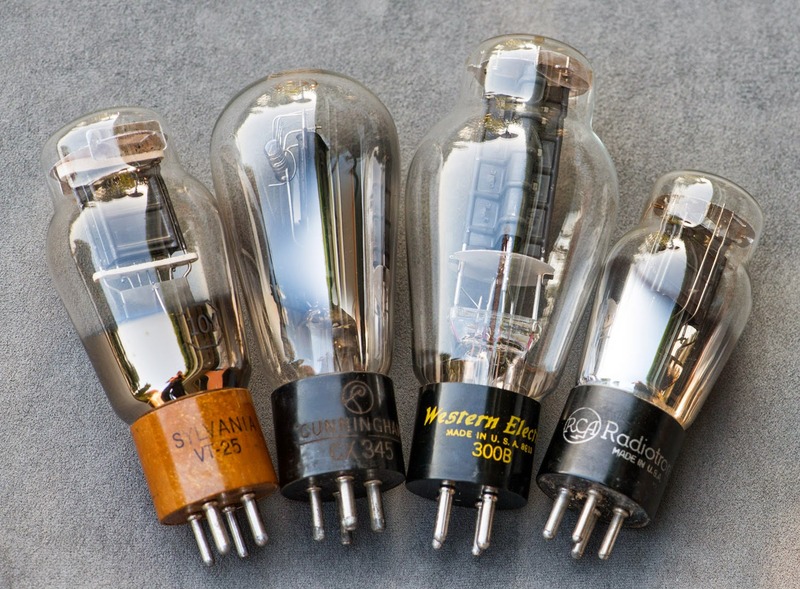 The only 'real' 300B is the Western Electric in my opinion. 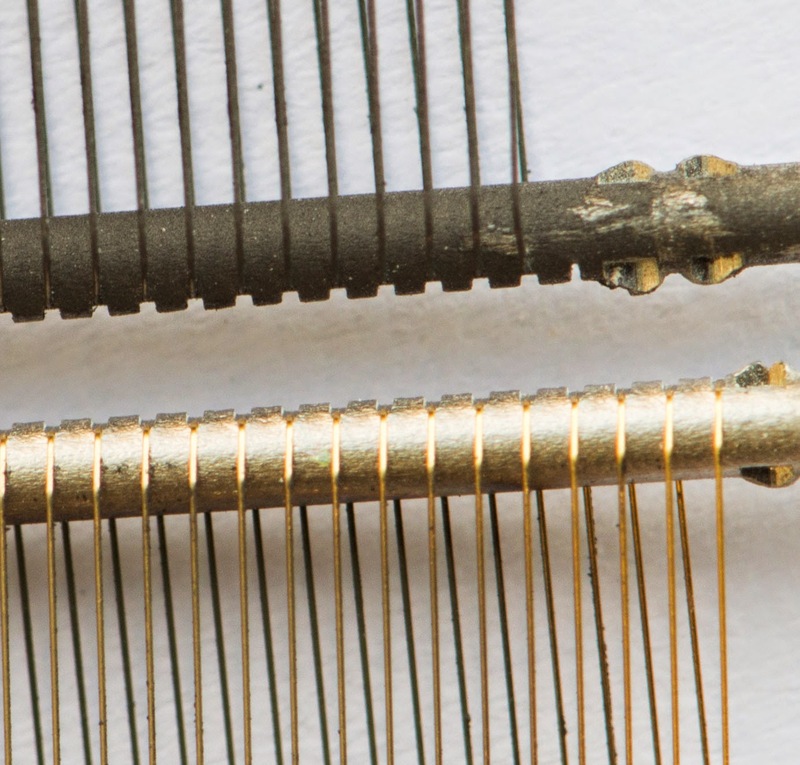 There is also another aspect: The use of the thoriated tungsten demands a compromise. 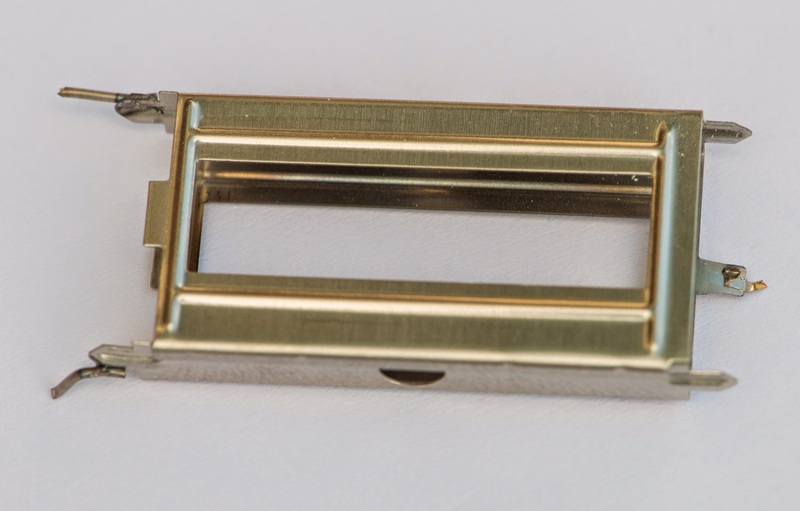 Amplification factor and plate resistance needed to be slightly altered. Amplification factor is a bit lower and the plate resistance a bit higher which results in lower transconductance. Yet the tube will work in any 300B amp. The maximum available output power will be slightly reduced. But that is well worth it, because it makes it a better tube in my opinion and in my ears. The sound of the tubes sparked several ideas for new stuff. A variety of 300B amps, both SE and PP, and maybe even a 300B line stage. I am in the process of characterising the tubes to create a data sheet which will reflect this. It is important for Elrog and for me to be very open about this. Detailed updates and figures will be published in future posts after I had a chance to run measurements on more tubes. 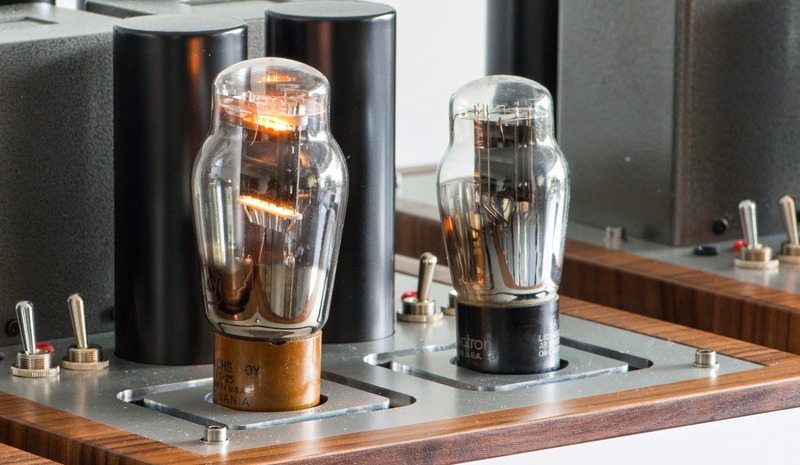 The tubes I have in the moment are pre production samples. Elrog is working hard to finalise series production which will take a bit more time than expected. I hope to be able to deliver the first tubes to customers before end of November. The first batch of tubes is already sold out through pre orders. Place your pre order now to get tubes from the second batch which should be delivered in December. UPDATE : I am not taking pre orders any more at this time since demand is higher than the expected production capacity. I will notify when I can accept pre orders again. I know that many of you are waiting for my report about the Elrog 300B. Please be a bit more patient. I don't want to write out of the first moment of excitement. I rather live with the tubes for some time and give them a thorough listen. What I can say already: This is going to be very interesting! 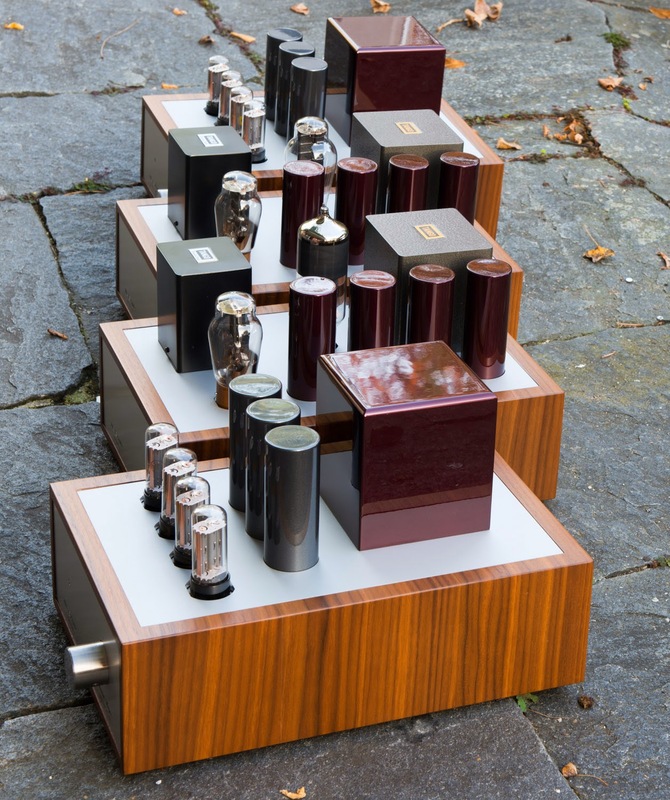 A four chassis affair, monos with separate power supplies for each channel. The photo above only shows one mono block. 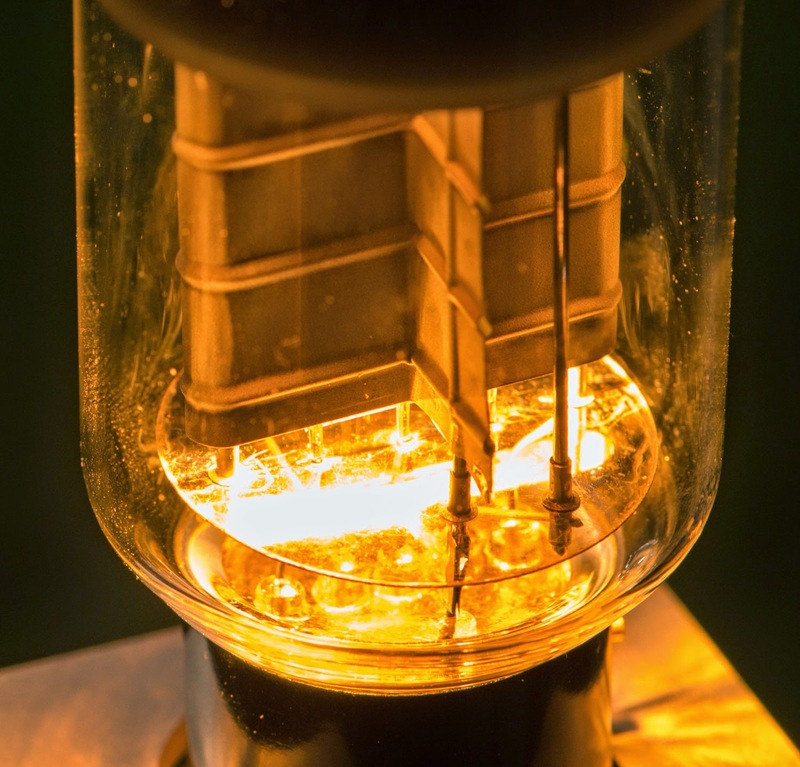 The 300B is driven by a 10Y through an interstage transformer. 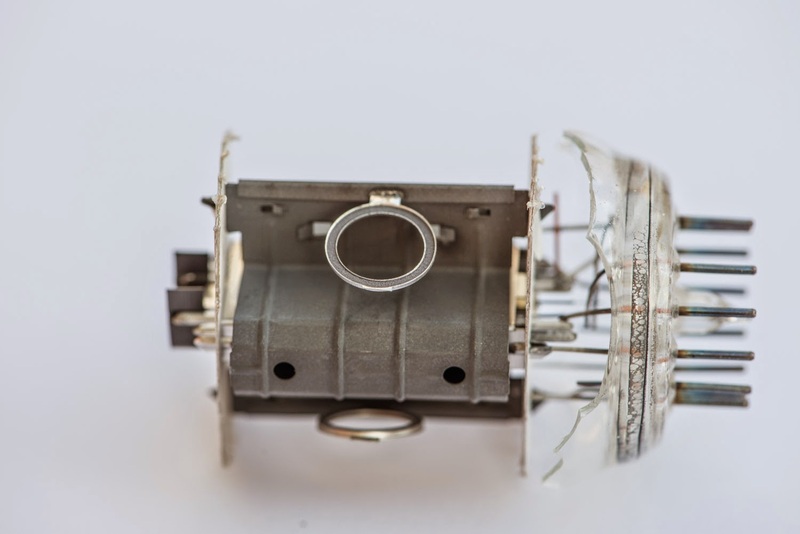 Interstage and output transformers are made in Japan by Tango. In this case the transformers are from old production when Tango was still part of Hirata Electric. The interstage transformer is the fabulous NC20 and the output transformer is a permalloy core NY15-3.5S. The latter has not been made any more after Tango split from Hirata and continued under the ISO Tango name. These are very rare and unique transformers. With their 3.5k load they are ideal for the 300B. Both the driver tube and the 300B are heated with DC for zero hum and to avoid any kind of modulation of the signal by the mains frequency. Due to the extensive use of chokes in both B+ and filament supplies each unit is still quite heavy, although the amp is split into 4 chassis. 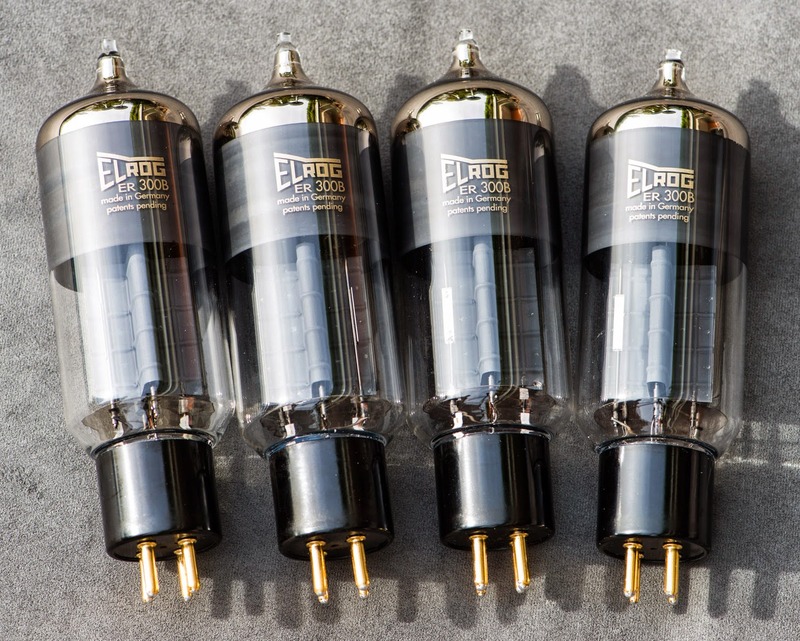 Above one channel is equipped with Elrog and there other with Western Electric. The driver configuration brings out the best of the 300B in my opinion and is at least as important as the output tube. So this is the ideal test amplifier to assess the sound of the Elrogs. 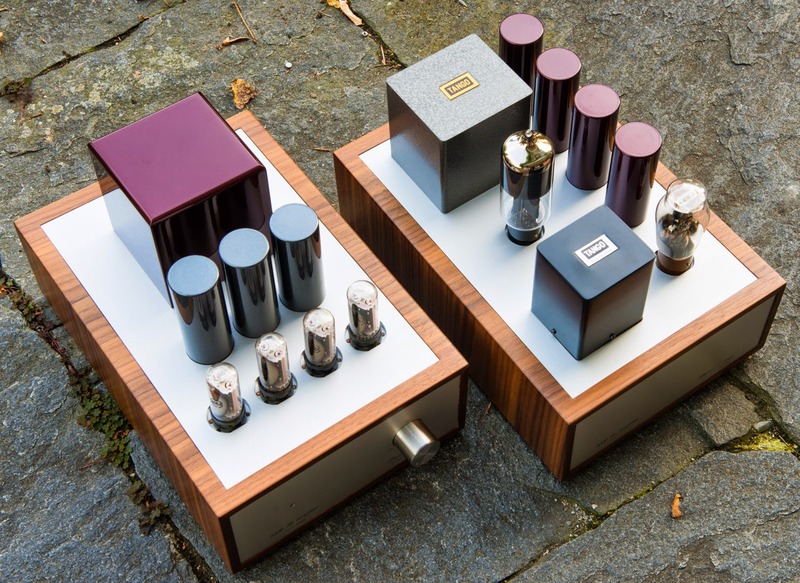 After I finished the assessment of the Elrog tubes, these amplifiers will be up for sale. Drop me an email if interested. So please bear with me for some more time until I post my findings about the Elrog tubes. These will most likely come in several parts as I gain experience with them. 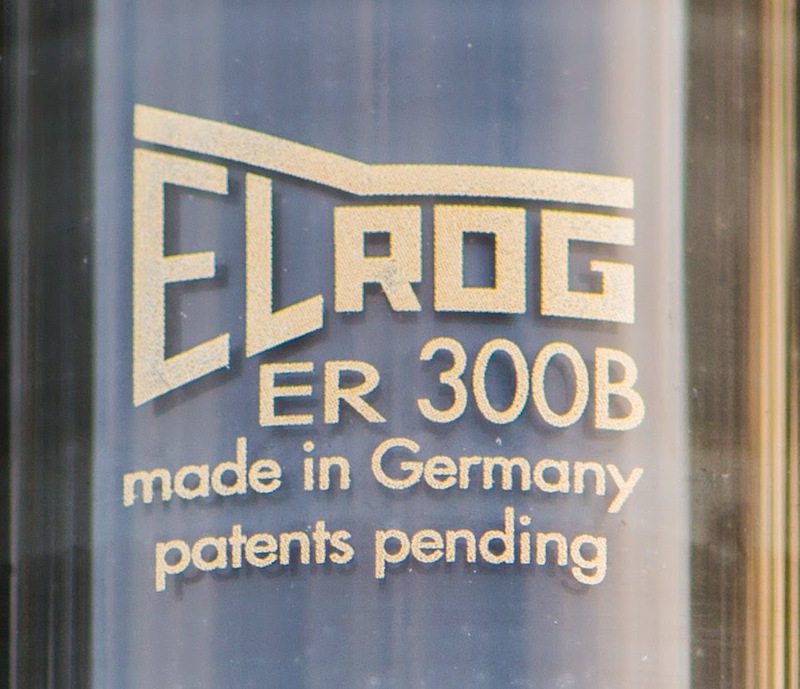 The ELROG 300B is here! I am excited to announce the big news. 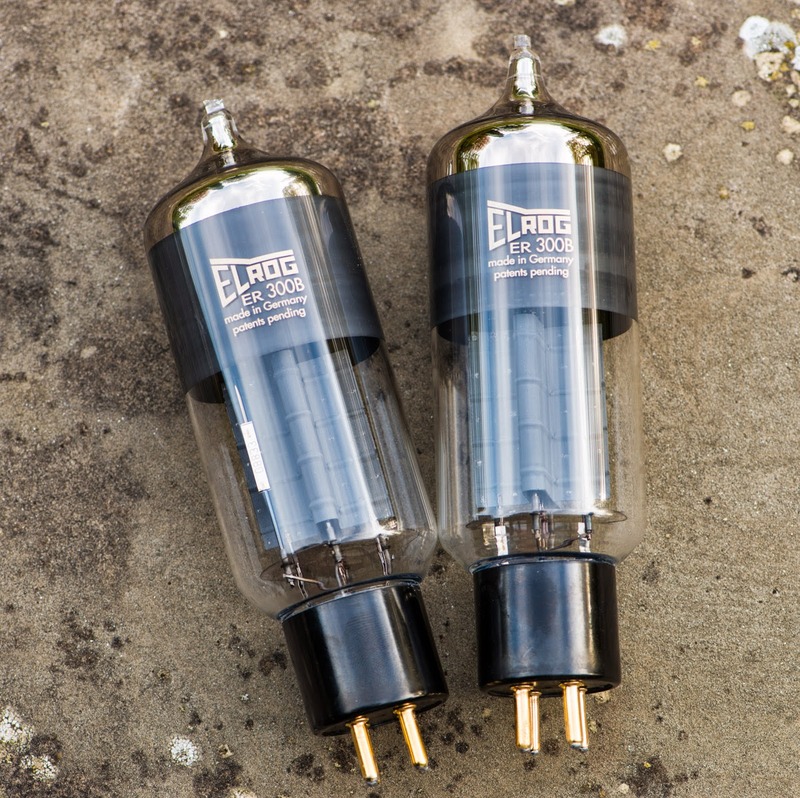 After about a year of intense development ELROG shipped the first samples of the long awaited ER-300B tubes to me for evaluation. This can be regarded as a historic moment in tube history. The first 300B tube developed and manufactured in Germany. I am very proud to be part of this. 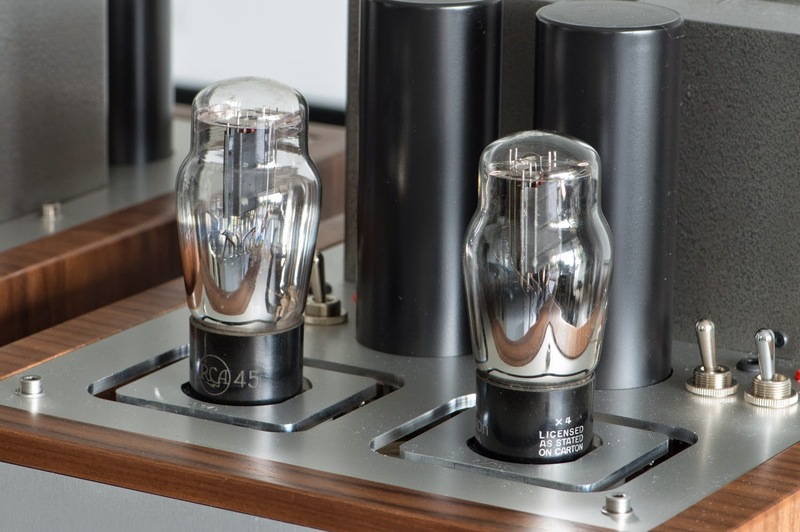 When I first met Dr. Schaffernicht on the High End fair in Munich in 2013, I convinced him that a 300B tube would be the perfect next step to enhance the portfolio of his magnificent 211 and 845 triodes. Being a perfectionist, Dr. Schaffernicht would not give out any samples of this tube before he is 100% happy with it. It was hard to stay patient, but now I am holding them in my hands and I am happy to share this news with you. I have not listened to them yet since I wanted to share the first photos with you. I ran a quick test on the tube tracer and they simply look perfect. The plate lines of the pairs are matching 100%. I am also happy to announce that I am now starting to take pre orders for them. The first batch of tubes for delivery to customers is expected before end of October. The price for the Elrog 300B is 975,- Euros for the matched pair for EU residents. The export price outside the EU is 820,- Euros for the pair. Since these tubes are completely hand made, the production capacities are very limited. If you want to secure a pair for yourself, you can send you order to me by email. My contact information can be found under the Impressum/Contact link. 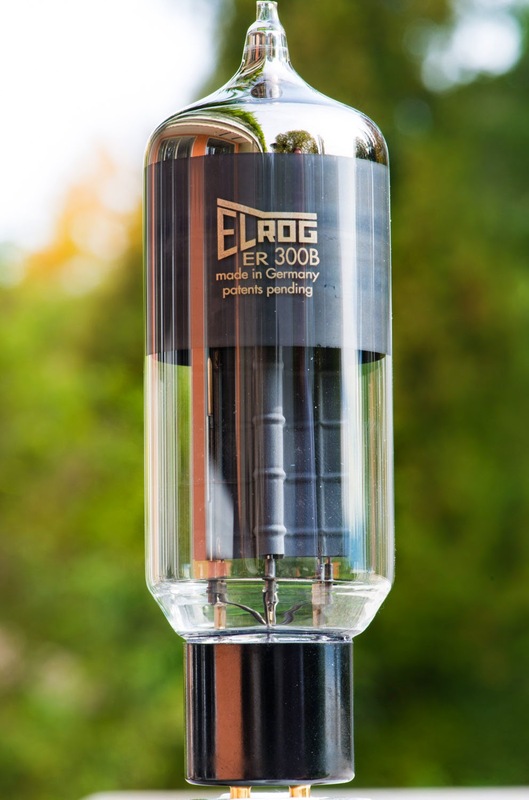 Stay tuned for more detailed reports about the Elrog ER300B! Endlich ist sie da, die Elrog 300B. Nach etwa einem Jahr intensiver Entwicklungsarbeit bekam ich heute die ersten Evaluierungsmuster. Dies kann ohne Übertreibung als historischer Moment in der Röhrengeschichte angesehen werden. Ist dies doch die erste in Deutschland entwickelte und hergestellte 300B. Ich bin stolz daran teilhaben zu dürfen. Bei meiner ersten Begegnung mit Dr. Schaffernicht auf der High End in München 2013 überzeugte ich ihn, dass eine 300B die perfekte Ergänzung zu seinem aus der 211 und 845 bestehenden Röhrenportfolio wäre. Als Perfektionist der er nunmal ist, hat er erste Röhren erst freigegeben, nachdem er 100% zufrieden damit war. Aber nun sind sie endlich da! 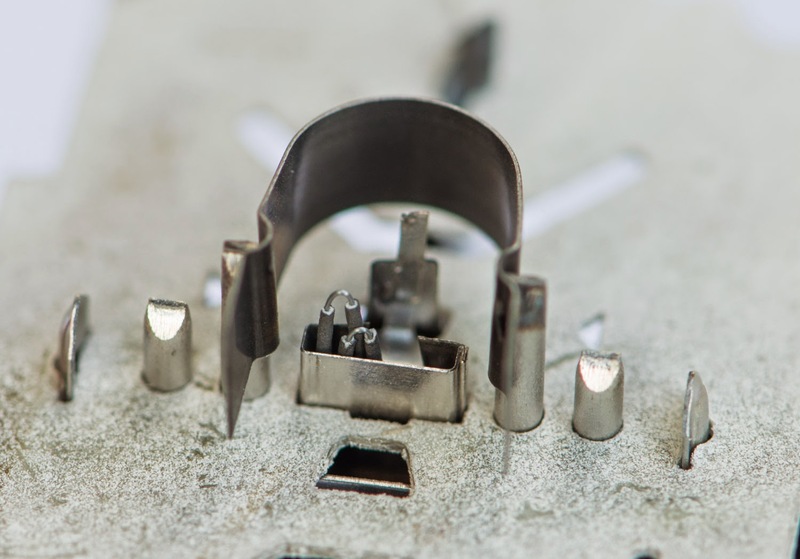 Wie schon bei der 211 und 845 hat Dr. Schaffernicht nicht einfach die Vorlage von Western Electric kopiert, sondern seine eigenen Lösungen eingebracht, was sich am deutlichsten in der 'nicht klassischen' Kolbenform zeigt. Ich finde die Elrog 300B einfach umwerfend schön und extrem gut gemacht. Ich habe die Röhren noch nicht gehört, da ich die Neuigkeit so schnell wie möglich mitteilen wollte. 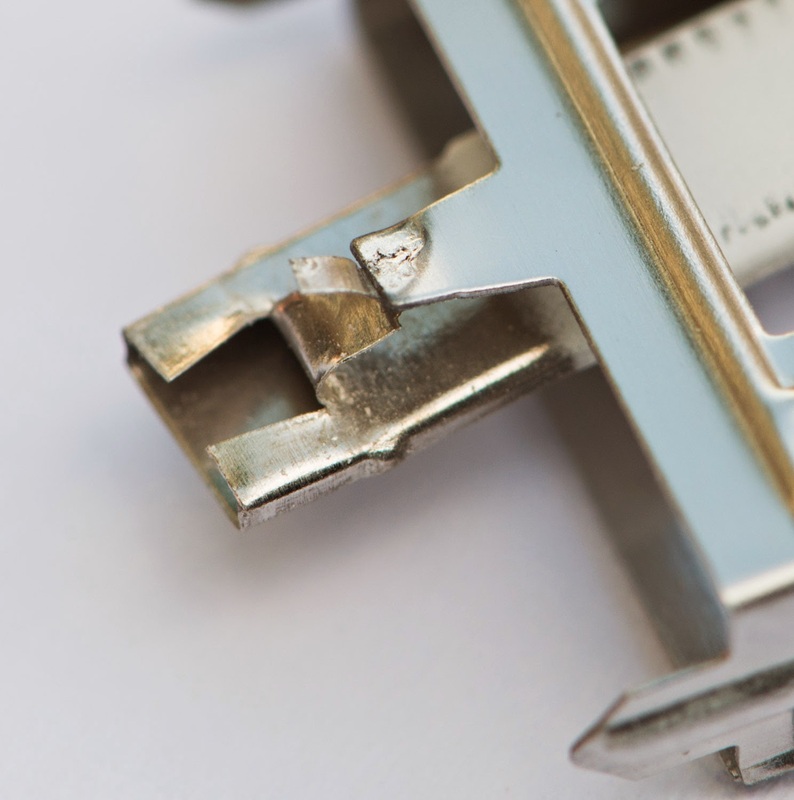 Ein schneller Test mit Kennlinienschreiber zeigte eine perfekt lineare Kurvenschar, welche absolut deckungsgleich bei einem Paar ausfällt. Ich freue mich auch mitteilen zu können, dass ich nun Vorbestellungen für die Elrog 300B entgegennehme. Die erste Lieferung für Endkunden erwarte ich gegen Ende Oktober. Der Paarpreis liegt bei 975,- Euro inklusive Mwst für Lieferungen innerhalb der EU. Der Exportpreis ausserhalb der EU beträgt 820,- Euro pro Paar. Die Kontaktdaten für Bestellungen finden sich unter dem link Impressum/Contact. Auf Grund des hohen Arbeitsaufwands in der Herstellung sind die Produktionskapazitäten sehr begrenzt. Auslieferungen erfolgen in der Reihenfolge des Bestelleingangs. Weitere detaillierte Berichte zu der Röhre folgen in Kürze! Due to popular demand I will describe my sound impressions of the various tube combinations in the recently shown amp which is configurable. Before I get to the sound descriptions I'd like to write a bit about this topic in general to put my findings into perspective. 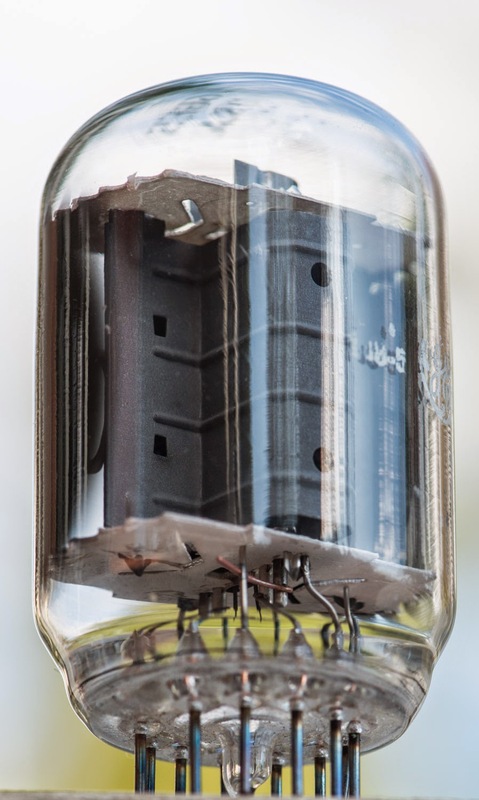 In one of my 'How Does it Sound' posts I already wrote that I think there is way too much focus on the output tube of an amplifier. 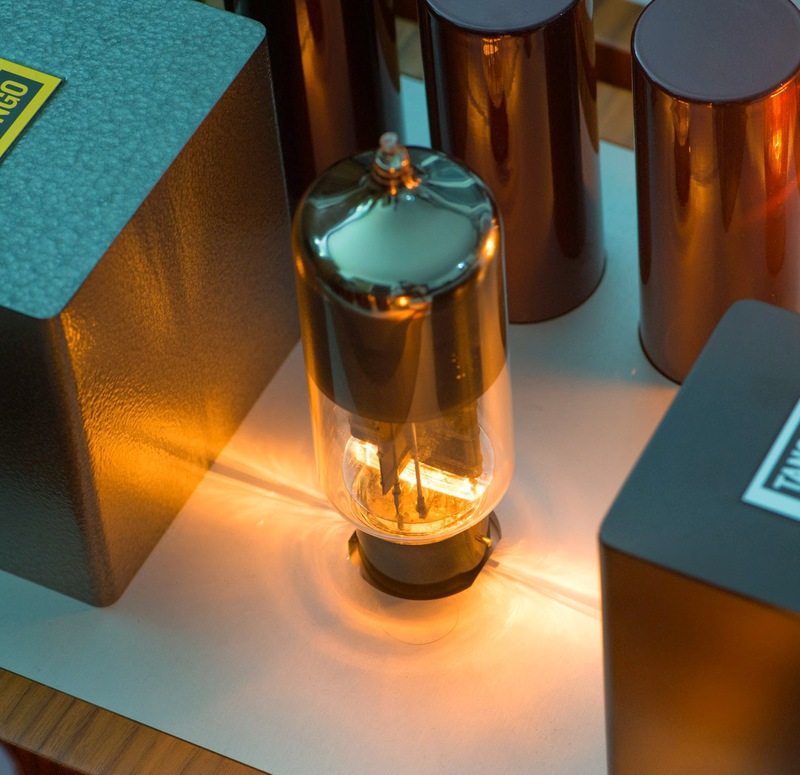 There is a belief in the audio community that the output tube largely determines the sound of an amplifier. 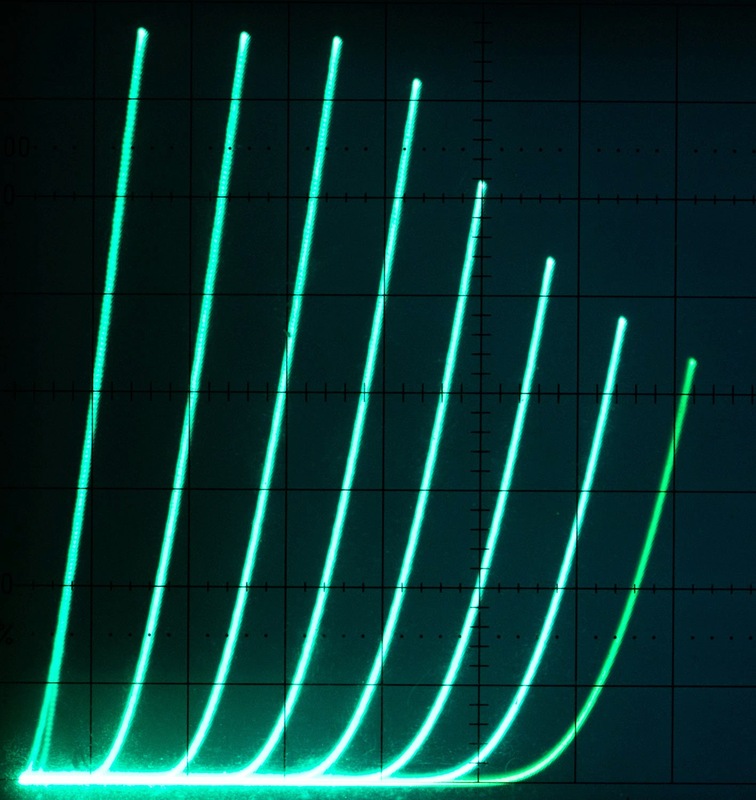 There are even certain sound characteristics associated with tube types. 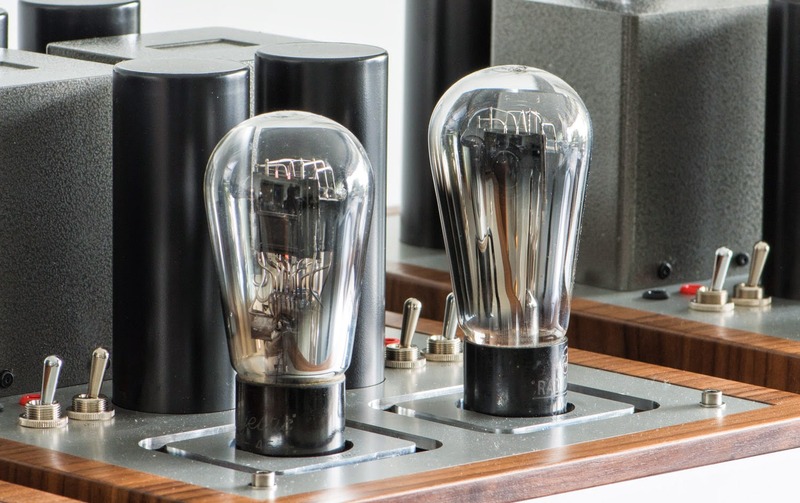 Everybody I know who develops and builds amplifiers himself had the experience how vastly different the same tube can sound in different amps. 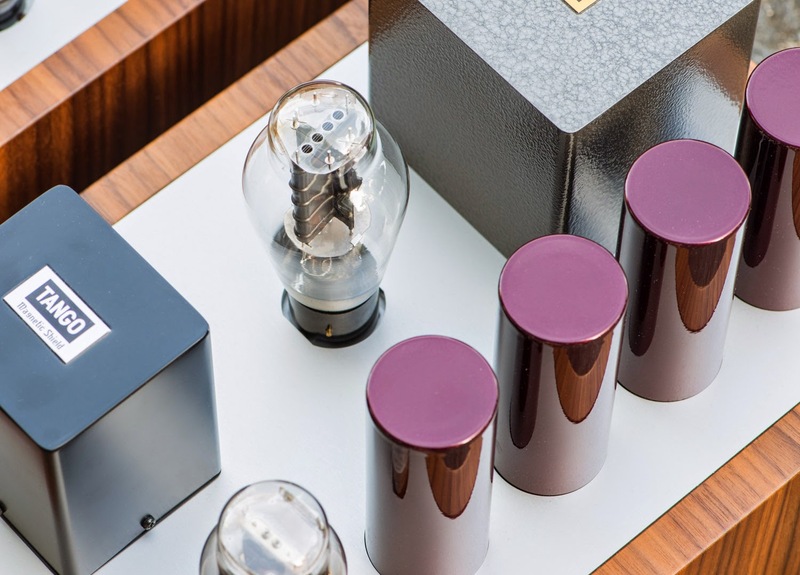 While there certainly are sound differences between tube types and even between different variants of the same tube, the overall sound characteristic of an amplifier is much more influenced by the circuit topology, power supply design and overall quality of the parts used. 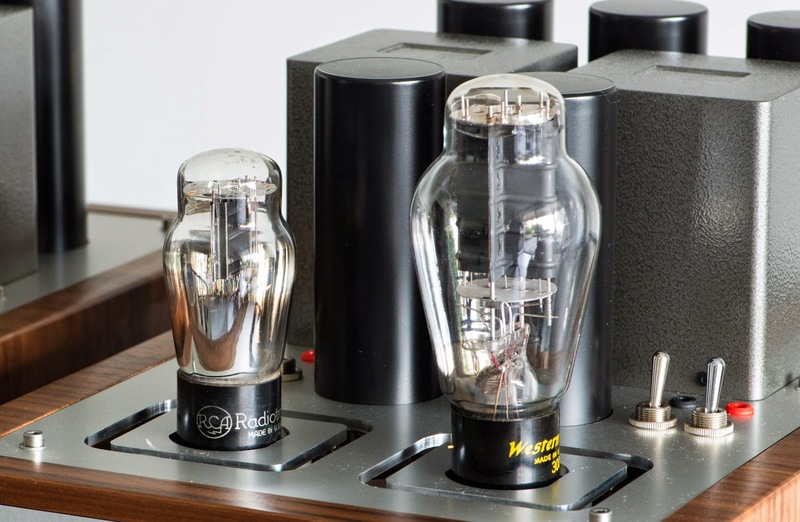 Also the driver stage and driver tube have a big influence, in some cases this can even impact the sound more than the output tube. 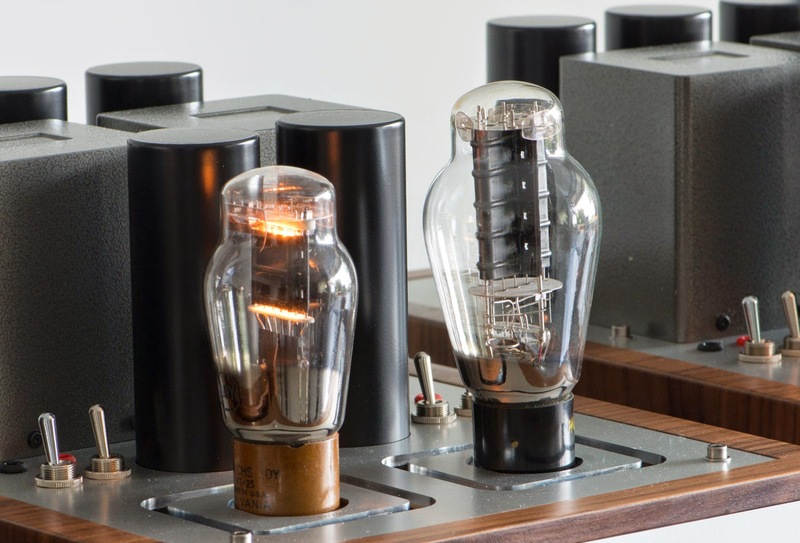 Although it is not really feasible to quantify this, I would say the output tube maybe has 10% - 15% influence on the overall sound of an amplifier. Then there is the interaction between amplifier and speaker. 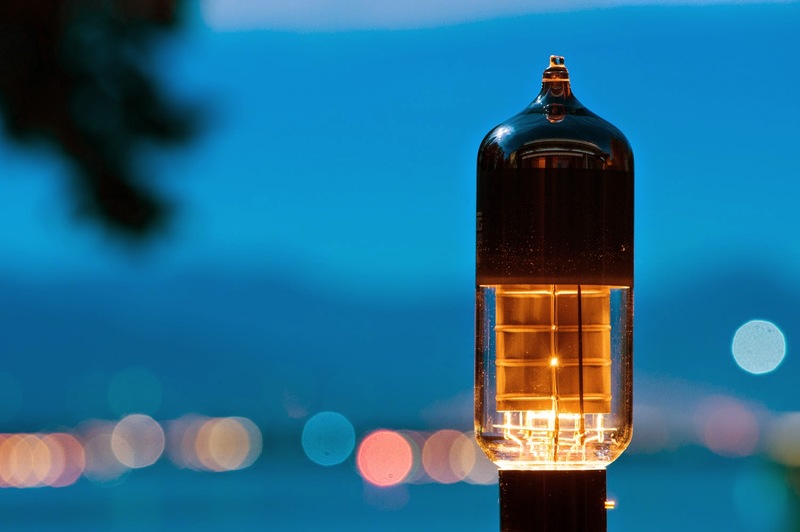 Different tubes have different plate resistances which can result in different output impedances of the amp, even if the amp has some means of adaptability, this may or may not impact the sound result, depending on how sensitive the speaker reacts to this. 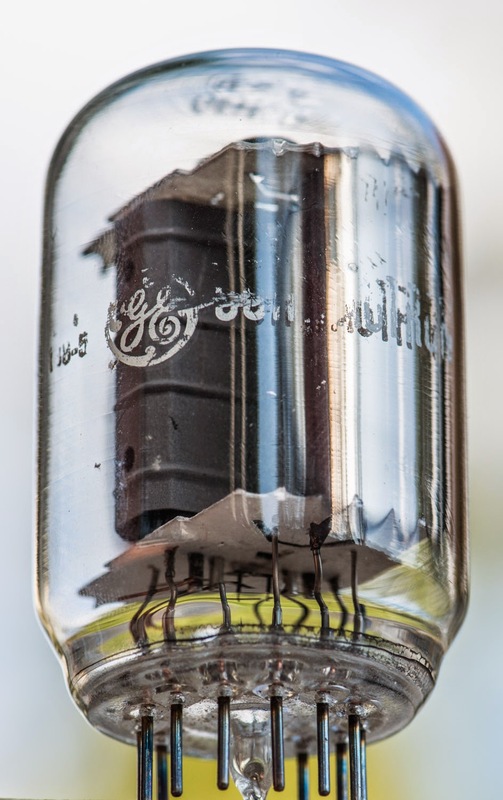 Also keep in mind different tubes have different amplification factors. So part of the result can be due to the fact that the driver has to provide more drive voltage for an output tube and thus contributes more to the overall distortion characteristic of the amp. And lastly sound impressions are very subjective and system dependant. 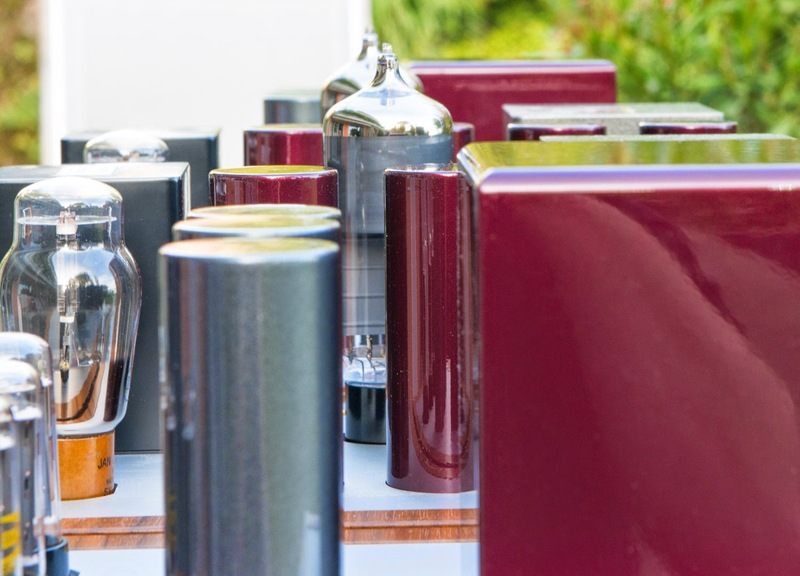 I learned that different people with the same amplifier develop different tube preferences. So here are my personal subjective findings. These are valid for my taste and in this particular amp playing in my system. 45 drives 45: 'Pure 45 Bliss'. Ultimate tone and musicality. Very relaxing sound. A bit forgiving which can be of advantage for certain records. 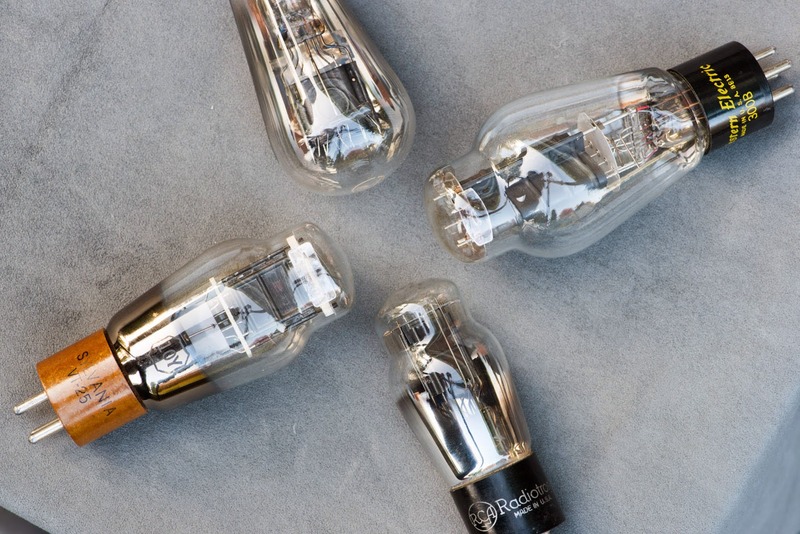 Best are globe tubes which provide the smoothest sound of all, yet reveal a lot of detail. Globe 45s excel in reproduction of voices. 10Y drives 45: Keeps the tone and musicality of the 45 combined with the ultimate resolution of the 10Y. Very neutral and transparent. Well defined and deep bass. Probably the truest combination, but it is easy to fall for the tone of the '45 squared'. The 10Y driver has more gain than the 45 which gives a better input sensitivity. 10Y drives 300B: In my opinion the 10Y is the best driver for the 300B and is able to drive it to it's full capabilities. Very transparent, very neutral. Similar qualities as the 10Y/45 combination but with more power. Subjectively more bass but with slightly less definition than the 45. Beautiful voices, but maybe some tendency to exaggerate voices a bit. If the power of the 45 is sufficient, it would be my preferred choice. 45 drives 300B: Even more forgiving than 45/45. 'Vintage' character. Rounded off edges. Very smooth, even a bit too smooth to my taste. Less resolution. Weaker bass than with the 10Y driver. My least favourable choice of the 4 combinations. But it can be just the right combination for certain tastes or systems. This combination has the least headroom in the driver. headroom is one of my most important design aspects, these listening results proved that again for me. The comparisons above have been done with NOS tubes. RCA ST45s and Cunningham globe CX-345. Sylvania 10Y/VT25. The 300Bs were Western Electric 1980ies production. More about different 300Bs when the Elrog tubes arrive. The 45s were used with 5k load and the 300B with 3.5k. Wow, I can't believe that I gave in and actually wrote such sound descriptions. Please take it with a grain of salt. Let your own ears be the judge and use what you like best, no matter what others say or write. Actually when I re-read my descriptions, they appear exaggerated. The basic sound character of the amplifiers was apparent and dominating with all these combinations.